Detection dog handlers work with canine partners that are tasked with finding bombs, drugs, agricultural products, and other prohibited items. They are frequently employed in positions at airports, border crossings, and shipyards; additional opportunities with the military and police departments continue to increase strongly each year. The salary for detection dog handlers may vary based on the specific nature of their employment, but can generally range from $50,000 to $100,000 per year. Fish and game wardens are tasked with patrolling a designated area to enforce laws and hunting regulations related to the local wildlife population. Wardens are licensed to carry a firearm while performing their duties, and they have the authority to arrest those who violate the law. Most wardens work for the state or local government and go through academy training before going on patrol. The annual mean salary for fish and game wardens (employed by state governmental agencies) was $56,540 in a Bureau of Labor Statistics survey. Mounted police officers patrol a specific area on horseback, maintaining public safety and ensuring crowd control at events. Mounted officers may work for state and local government agencies, police departments, and the military. 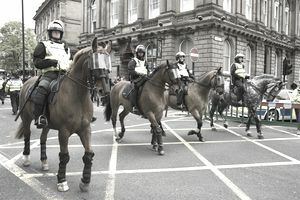 Mounted officers must first become regular police officers and work on regular patrol for several years before applying for the mounted program. Once accepted, an officer must go through a training program for the mounted unit that can take several months to complete. The median salary for police officers was $52,540 in a BLS salary survey. K-9 police officers handle dogs used to track and apprehend suspects. Officers must have several years of experience on patrol before applying for the canine unit. Once assigned to the canine unit, an officer is matched with a dog and goes through an extensive training program before going out into the field with their new partner. The median salary for police officers was $62,960 in a BLS salary survey. Animal control officers enforce licensing laws, investigate cruelty cases, and humanely capture dangerous or stray animals. There are several educational paths and certification options for this career. Most officers are employed by state and local governments, and they are assigned to patrol a specific county or region during the course of their duties. Animal control officers earn an average annual salary of $32,050. Management and investigative positions can carry a salary of more than $50,000 per year. Animal lawyers are responsible for casework that may include animal abuse, veterinary malpractice, and animal welfare. While this is not a career that offers much (if any) hands-on interaction with animals, it does serve an important function in protecting animal welfare and introducing important animal legislation. Most law schools (including Harvard) offer classes that specifically focus on animal law, and some (such as Lewis & Clark) offer a complete animal law career path. According to a BLS, the annual salary for lawyers was $119,250. Animal health inspectors monitor farms, animal shelters, livestock facilities, research labs, and quarantine facilities in a particular area to ensure that animals are treated humanely and that all facilities are up to code. Inspectors may take samples for analysis, make biosecurity recommendations, and liaise with veterinarians during the course of their duties. A degree is usually required for inspector positions, and a background in a veterinary related field is a plus. Most animal health positions are found with state government, local government, or processing facilities. The median annual wage for agricultural inspectors was $41,390 in a BLS salary survey. Wildlife inspectors are responsible for inspecting commercial shipments of wildlife species and wildlife products as they are imported and exported. Inspectors are tasked with confiscating illegal animals or products, checking documentation, and searching for smuggled animals or products. Most positions in the United States are located at 18 major ports and at the Mexican and Canadian borders. A background in law enforcement and animal science is beneficial for candidates; additional training must be completed at a federal center. Depending on their experience and advancement up the pay grade scale, wildlife inspectors can expect to earn between $35,000 and $65,000 per year according to the pay scales available on the federal USAJOBS website.